With the real estate market up and public appreciation for design surging, residential buyers are willing to pay more for the cachet of a big-name architecttand developers are catering to the new demand. But are designer buildingss adding quality to New York’s urban fabric or just padding developers’ pockets? Anna Holtzman finds it’s a little of both. Is residential real estate in New York finally catching up to its stylish inhabitants? 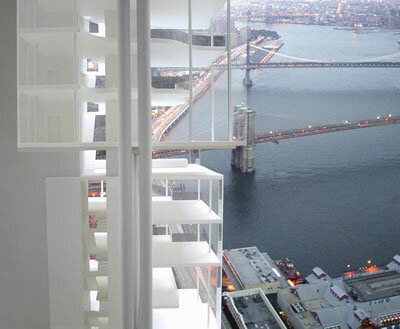 The city seems to be going through a design boom: Richard Meier, Santiago Calatrava, Philippe Starck, Tsao & McKown, Winka Dubbeldam, Gwathmey Siegel, and Michael Graves have all recently made, or will soon make, their mark on the lower half of Manhattan. And there’s talk of on-the-boards residential buildings by Frank O. Gehry and Christian de Portzamparc. The projects come with swanky names (the River Lofts, the Downtown), luxury amenities, and high-end price tags to boot. If you suspect this designer craze is all about name-branding, you’re right. The draw of well-known architects for developers is obvioussthey establish a certain price-point, like a designer label; they add status to a project,, said Bassie Deitsch of Boymelgreen, the developer responsible for the Starck and Tsao & McKown buildings, both on the lower west side. But before dismissing this phenomenon as a superficial trend, one must take into consideration the bigger picture. 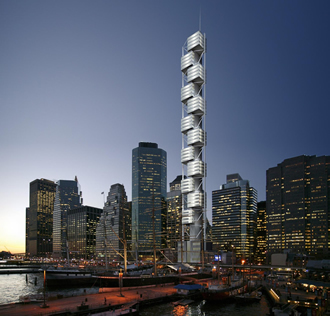 As New York architect and developer Peter Moore put it, any builder taking the risk of high design is a good thingg?whatever the initial motivation. And motives evolve. As Izak Senbahar, developer of the new Richard Meier tower on Charles Street, said, It raises the bar. Everyone is working for profit, but when you drive around the city and see something beautiful and elegant, you’re encouraged to do more of that..
For Frank Sciame’s first real estate development, 80 South Street, Santiago Calatrava proposes townhousess floating in the air. Opinions vary on what has spurred this recent interest in design. Perry Street, and the amount of press it generated, did a lot to create that awareness,, said Meier, referring to the pair of gleaming residential towers he designed. Others see it as the result of broader influences: The time was right for this,, said Frank Sciame, developer of the Calatrava-designed South Street tower, currently in the works. Five years ago, we would have done a conventional tower.. Ironically, it was the tragic events of September 11 that indirectly led him to select a visionary architect for the project. After 9/11, given the great buildings that were going up at Ground Zero and the fact that this site was [relatively nearby and] at the river’s edge, we decided that it should also be a tangible symbol of Manhattan’s recovery.. What emerged was an unusual design by Calatrava comprised of 10 boxlike units that seem to float independently in the air. Senbahar agreed that post-9/11, New Yorkers have a greater appreciation of good architecture. So if you create something of quality, people will pay more for it,, he said. So why has it taken New York this long to wake up to design, when cities such as Miami and London started using architects to market residential buildings years ago? Senbahar posited, In New York, apartments sell from the inside out. Layout is important.. Meanwhile, faaade is secondary. There’s also a greater demand for real estate in New York, so you have a captive audience,, said Senbahar. 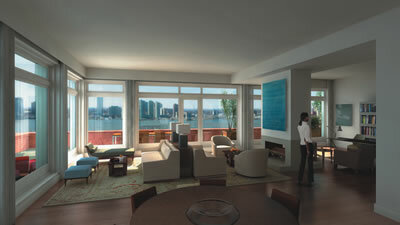 In Miami, you’re talking about mostly second homes, so you have to entice the buyer with attractive buildings.. He continued, In construction, if you keep it simple, it’s a lot easier.. So when the real estate market was lower, developers preferred to play it safe by sticking with conventional designs that were cheaper to build. Now that the market is up, developers are taking advantage of the fact that buyers won’t blink at higher price-tagssand are using the added value of design to compete with one another. Dubbeldam, who designed the interiors and undulating curtain wall of the Greenwich Street Project, cringed at this sort of thinking. Quality is not more expensive,, she stated emphatically, because it pays out more in the long run. It’s better for the developer in the end.. Dubbeldam is appalled by the majority of American developers, saying that they have no consciousness about energy, no thinking about ecologyythey think that architects are just fancy picture-makers.. 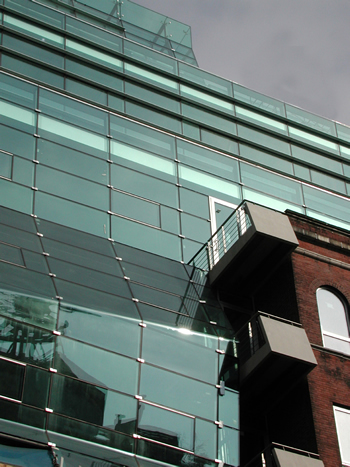 The glazed curtain wall of the Greenwich Street Project by Winka Dubbeldam of Archi-Tectonics cascades to the street. Just how far developers are willing to involve architects in their grand plans varies from project to project. In many cases, as with the now two-year-old 425 Fifth Avenue designed by Michael Graves for developer Trevor Davis of Davis & Partners, the exterior and interior designs are done by a high-level architect, but considerations such as floor layouts and interior detailing are determined by a combination of real estate consultants and contract architects. The Sunshine Group is one such consulting firm. In addition to marketing, the group consults developers on pre-development planning, which architects to work with, apartment layouts, ceiling heights, number of bathroom fixtures, closet size, et cetera. Boymelgreen brought in Sunshine to consult on the Downtown, which in turn selected Starck to infuse the interiors and entryway with his signature playful style. Layouts and faaade, however, were left to project architect Ishmael Leyva. Terraces, French doors, skylights, fireplaces, Sub-Zero and Miele appliances, and spa-like bathrooms are among the amenities at the River Lofts, a combination restoration and new construction project by Tsao & McKown. Some architects are pushing to increase the scope of their roles, however, and changing developers’ minds in the process. In the case of Tsao & McKown’s River Lofts, for example, Sunshine initially invited the architects to work on the project to add our particular brand of lifestylee to the interiors of the apartments, said Calvin Tsao. However, Tsao & McKown ultimately convinced the developer, Boymelgreen, to let them have a hand in the faaade as welllwith the support of Sherida Paulsen, then chair of the Landmarks Preservation Commission. When it came to the firm’s next project with Sunshine and Boymelgreen, the Spring Street Lofts in SoHo, the architects were brought in at an earlier phase and were able to collaborate with the client in a much more organic way. Rather than look askance at being called in as lifestyle gurus,, said Zack McKown, we saw it as an empowering position.. 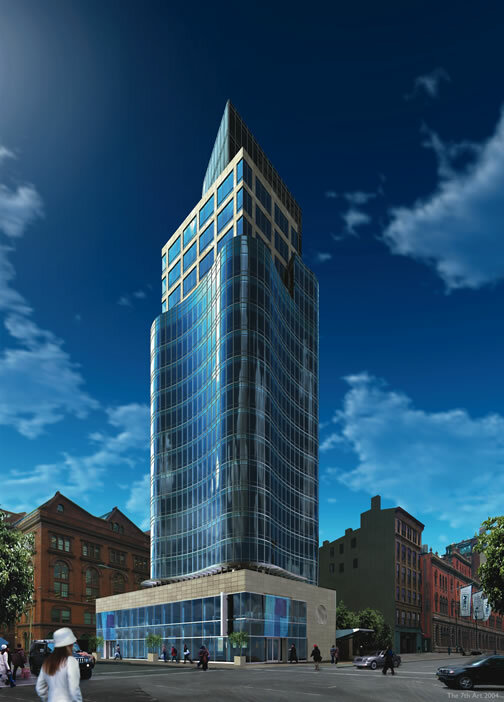 The newest Meier tower, still under construction, echoes the first two completed in 2002, in design, luxury amenties, and price points. A rare few architects are getting in on development at the ground level. Dubbeldam was brought onto the Greenwich Street Project by developer Jonathan Carroll of Take One before he even had a site in fact, Dubbeldam wound up find ing its location. 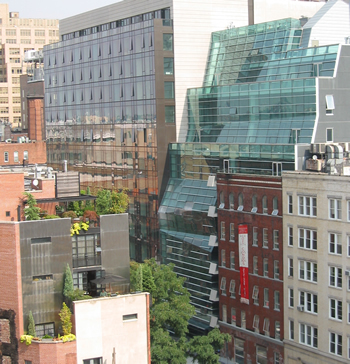 In the case of Charles Gwathmey’s Astor Place tower, the architect found himself in the unusual situation of starting out on the client side, as a board member at Cooper Union. Before signing on as the designer, he hired the developer, Related Companies, and selected the site himself. It was only later, after a series of unscripted events including Gwathmey leaving Cooper’s board, that he was brought on as architect and was thus able to shape every part of the project, from the footprint to interiors. What truly smart developers have come to understand is that taking architecture into consideration from the get-go can only benefit the value of their building in the long run. 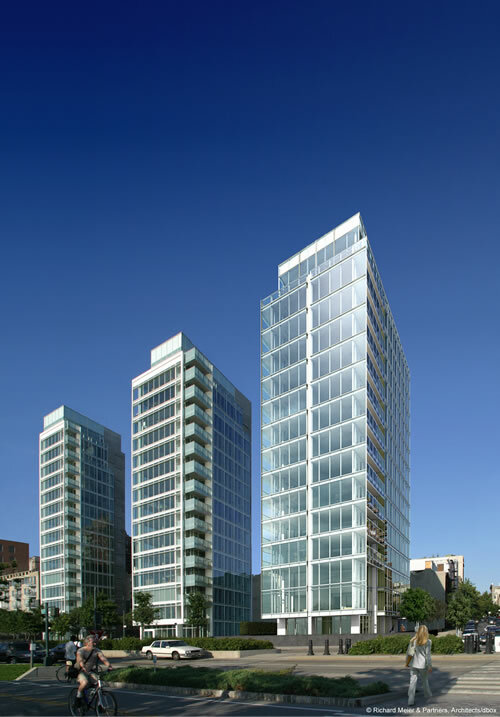 Senbahar chose Meier for Charles Street in deference to the Perry Street Towers, which were already built by developers Ira Drucker, Charles Blaichman, and Richard Born when he came on the scene. He wanted to maintain a consistent aesthetic among a grouping of buildings that he believes may someday be landmarked. In improving the neighborhood, this move also improves that which remains a developer’s main concern: real estate values. Charles Gwathmey’s Astor Place is being touted by its developer, the Related Companies, as Manhattan’s first rotational, asymmetrical, sculptural building.. Unfortunately, as Dubbeldam pointed out, the vast majority of developers are still stuck in the dark ages in terms of design. I think [these high-design buildings are] just isolated projects,, said Dubbeldam, but I hope they can inspire overall change.. Yet when it comes to the realm of affordable housing, even the optimistic have little hope that these high-end projects will inspire change. Unfortunately,, explained Senbahar, whenever design requires a higher level of construction, it’s reflected in the cost, and therefore it would be very difficult, especially with the high land prices in New York.. Developer Moore lamented, We still have a long way to go [towards better design for the city as a whole]. That’s where the city should get involved. There’s no even-handed aesthetic control. We need an aesthetic cop..
ANNA HOLTZMAN, A FORMER EDITOR AT ARCHITECTURE MAGAZINE, IS PRODUCING A DOCUMENTARY ABOUT SUBWAY MUSICIANS.